This website provides information for black homeschoolers. This past summer I had the opportunity to present a few workshops at Southeast Homeschool Expo in Atlanta, Georgia. Many people I chatted with explained how they were in the process of moving their children from a traditional school setting into the homeschool setting. Though these families had unique goals and diverse teaching methods, the question they asked was the same: How do I transition my child from traditional school to homeschool? 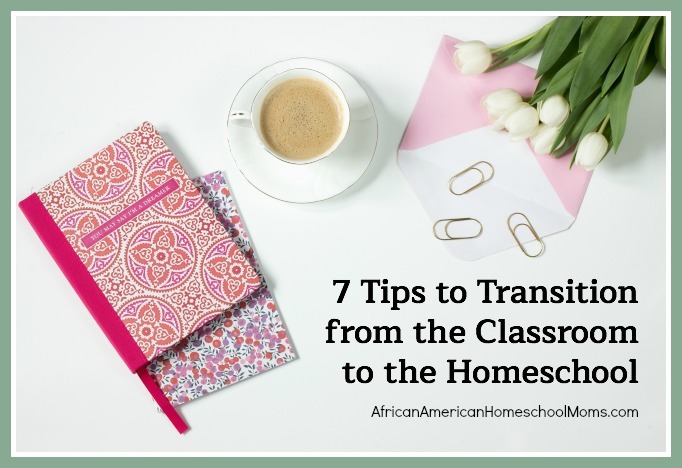 Transitioning from traditional school to homeschool can be intimidating, but it can be done. Here are seven tips to help you and your family make a smooth move. 1. Make sure you know your state’s homeschool laws. Every state has its rules for homeschooling. Review these guidelines carefully, so you remain compliant. State requirements vary, but some states may require testing, curriculum review, and student portfolios. The HSLDA website provides information about state regulations. 2. Don’t try to recreate school at home. Classroom lessons are structured for mass presentation. Homeschool lessons are formatted for personalized instruction, so take the time to create the comfortable atmosphere and reasonable schedule that fosters learning. School on the sofa, in the park, or at the library. You don’t need an official school room for teaching. 3. Take time to adjust. Fight the urge to nosedive into every suspect right away. If you do, you risk burnout and discouragement. Take time to adjust to this new educational experience by introducing subjects little by little. Consider just doing math and literature for the first week, then adding additional subjects in future weeks. 4. Don’t rush your curriculum choices. There are many curriculum choices available, so take time to research the ones that appeal to you. Download curriculum samples and question fellow homeschoolers about their curriculum choices. Be sure to sure to consider your family’s needs as well. 5. Find your child’s learning style. Save time and energy by taking time to discover your child’s learning style. Is your child a visual, auditory, tactile, or combination learner? Once you determine how your child learns, you can select appropriate curriculum and create effective and appealing lessons and activities. My favorite resource on student learning styles is The Way They Learn by Cynthia Tobias. 6. Pace yourself. Homeschooling is not a race, so don’t try to imitate other homeschooling families. Their homeschool will look much different than yours because their children are not your children. Always remember to work at a pace that best suits the needs of your child. 7. Don’t be hard on yourself. You are doing something amazing, inspiring, life-changing, and challenging. From time to time, you’ll encounter a challenge that may feel overwhelming. When challenges come, face them and keep on moving. Do not beat yourself up about what you did or did not do. Do not ruin your day by rehashing what did or did not happen. Give yourself lots of space and grace! Enjoy yourself! Homeschooling is a wonderful blessing you should enjoy. Have fun teaching and learning alongside your children. Make marvelous memories you’ll all look back on fondly. Have you moved a child from traditional school into the homeschool? If so, let us know how things went. Would you offer any additional advice? Share your thoughts in the comments below and consider sharing this post with a mom who is making the transition from the traditional school to homeschool. © 2018, Andrea Thorpe. All rights reserved. Subscribe to African-American Homeschool Moms to receive updates AND a free 6-page Unit Study Planning Packet. Life Behind the Blog on Instagram!